Home > Blog > Other > New Ink! I love new inks. The more options of ink types and colors the better! Tomorrow I will be back to share a new pigment ink. Today? Today I am excited to share a new dye ink! 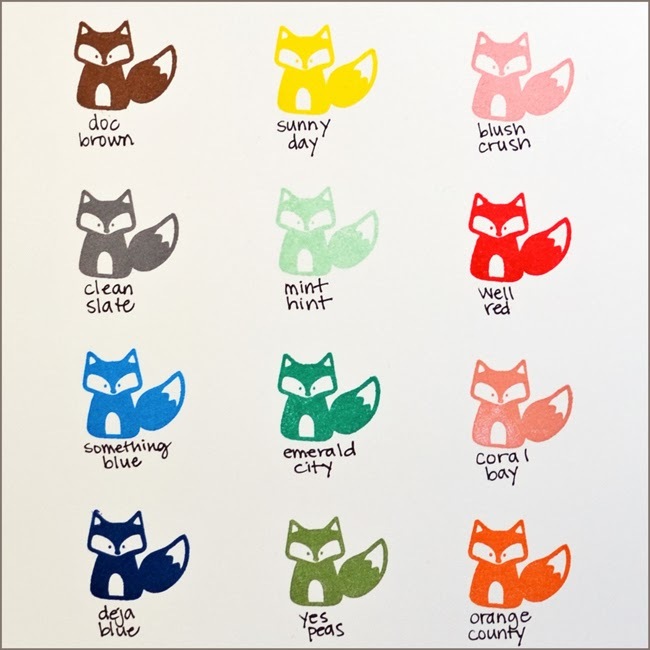 These new DYE inks are from Studio Calico. I hear they are good and I am dying to try them! (Pun intended.) They are quick drying, give even coverage and have a unique stackable design. The price for the bundle is really good… and you can pre-order now. I know stuff goes fast over at Studio Calico, so I decided to get my pre-order in now and trust the colors will be good. Those folks are great with color. I also ordered their new color paper pack. It has 24 papers contains 24 unique polka-dot patterns designed by Tim & Beck. Lila is obsessed with polka-dots (and so am I) so I am excited to get this! They also have embellishments to match the inks, including sequins, buttons, alphabet stickers and enamel dots! These products are in support of their upcoming class, Color Theory. We have some overdue winners! The winner of the Studio Calico card kit is Lucy Schmidt and the winner of the Inspiration Ave stamp set is Lisa Stein. The lucky one who gets the new Hero Arts Inks is Lynne Morgan. I emailed you. Congrats to the winners! Those ink colors look yummy! I may have to pre order them as I am looking for a set of inks…the price is unbeatable! Thanks for posting this! You are so generous! I love studio calico too! Thank you for all your insight, inspiration and knowledge! Cheers! Well – the “L” ladies sure were lucky . . . congrats Lucy, Lisa and Lynne! Jennifer — I am also a HUGE fan of Polka Dots and will be ordering the paper myself…love it. I was wondering if you have tried the new inks yets and what you think about them and/or is you plan to do any type of comparison videos. I’m such a huge fan of Hero’s Shadow Inks and also now love the Memento Luxe Inks, especially for embossing and such! But, I’m also a bit of an INK Junkie and that has me wanting to order this set too? But then again…I also have oodless of Distress Inks, Stampin Up inks and so forth — making me wonder — Do I really NEED MORE??? Thanks for sharing this info with us, Jennifer…the colors are very pretty! Oh my goodness, more ink!!!! LOL.. Well, I can’t afford them, but I will be anxiously awaiting your review so I can drool that way!!!!! Hi Jennifer, I also pre-ordered these inks….I thought it was time….since I other ink pads from Stampin up are over 8 years old….lol. Can’t wait to try them out! Renewed enthusiasm for the craft of stamping. It has been a long time since I have done rubber stamping but what a huge advanced change it has taken!. I am a Big fan of your blog and admire your talent. I am excited to pick up the craft again, so many things I want to try. I do plan to start taking some of your classes too. I hope to collect in time all the supplies and tools that are available to paper crafting and the Wish list is long, lol. Hi Jennifer!!! How are you? Hope all is well!!! I’m a huge fan of you and your wonderful work/cards!!! Looking forward to your review! !